Cater to your large-breed dog’s specific needs when you serve up this wholesome food. Every bite contains easily digestible ingredients, vitamins and minerals for a nourishing meal that supports joint, heart, skin and coat health. 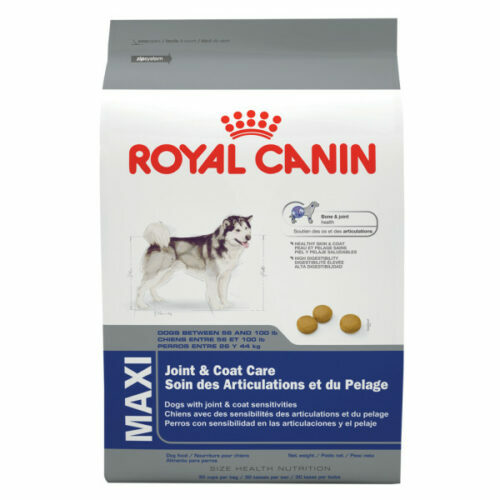 This Royal Canin Canine Health Nutrition MAXI Joint and Coat Care 28 Dog Food offers your large-breed doggy the extra boost he or she needs to remain happy and healthy. Glucosamine and chondroitin promote healthy joints for active mobility, while omega-3 and -6 fatty acids and a blend of vitamins and minerals offer your beloved pup healthy skin and a lustrous coat. The recipe features easily digestible chicken meal and brown rice for a wholesome and delicious meal that your pooch is sure to enjoy.